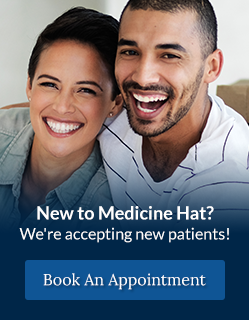 Dentist Dr. Michael Wenzel has always had a passion for Medicine Hat; during the four years he spent away from The Gas City, he was looking forward to his return and to forge a career at River Dental. Beyond earning his Doctor of Dental Surgery degree in 2014 at the University of Alberta, he discovered his passion for music; he formed a folk band with his classmates and performed at numerous events. Currently Michael is juggling the piano, cello and ukulele. During his third year, Michael happened upon the woman of his dreams at church – a Slovak girl named Natália – and married her just over a year later. Michael’s goals to become a Dentist started during his final years in high school. His drive and motivation grew in intensity as he continued his schooling at the Medicine Hat College. After two years there, he was accepted into the University of Alberta School of Dentistry. He enjoys all aspects of dentistry, and strives to play a significant role in comprehensive care delivery.